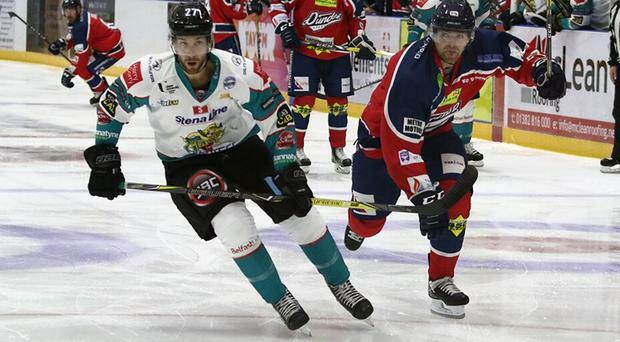 Kyle Baun hit a double as the Belfast Giants began their defence of the Challenge Cup with a 4-2 road win over the Dundee Stars at the Dundee Ice Arena. Aiming for back to back successes in the tournament, Baun's first two goals for the Giants helped them to the win, with Jim Vandermeer and David Rutherford also finding the back of the net for the visitors. A year ago, the Giants conceded a late equaliser in Dundee in their opening game of the season before losing on penalty shots, but this year they weren't to befall the same fate as they began their new campaign in a positive fashion with an important victory. After impressing in the two exhibition wins over the University of Manitoba Bisons, it was Tyler Beskorowany who got the start between the pipes for Belfast, while Dundee head coach Omar Pacha handed the reins to new Swedish backstop Pontus Sjogren. Belfast head coach Adam Keefe would undoubtedly have wanted a quick start, and he got it after just 41 seconds when Paul Swindlehurst fed Vandermeer at the blue line and the veteran defenseman fired a low shot past Sjogren. Darcy Murphy had a great chance to double the lead when he skated in on Sjogren from the right, only for the netminder to come up big with the save, before Beskorowany did the same at the other end when denying Lukas Lundvald in a two-on-one. After killing off a 5-on-3 penalty, the Giants struck again, Patrick Dwyer left completely unmarked at the net and, although he couldn't force it past Sjogren, David Rutherford was able to stab home the rebound at 14:33. The lead was cut just before the first intermission, however, as Stars winger Jordan Cownie rushed the crease and his fortunate (and unintentional) skate pass found Fabrizio Ricci, who had the easy task of sliding it into the goal at 18:43. And the lead evaporated 30 seconds into the second period when Matt Marquardt, on the powerplay, found space in the right circle and roofed a vicious slapshot to level the scores, with Beskorowany redeeming himself soon after to deny Charles Corcoran on a breakaway. A fairly tentative second period suddenly sparked into life when Belfast retook the lead at 35:28, defenseman Kendall McFaull firing on goal and Kyle Baun getting the redirect out in front to take it over Sjogren's shoulder and into the top corner. Both sides had chances to add to their tallies before the end of the period, David Rutherford not even testing Sjogren when on a three-on-one breakaway before Beskorowany produced an outstanding stop, going post to post to deny Lundvald again after Johan Andersson's feed into the slot. Having looked a little sloppy in the second period, it was all change for the Giants in the third as they came out reinvigorated and looked to finish the game strongly, although their initial efforts went unrewarded as Sjogren stood tall. But eventually the crucial goal came to give them the two-goal advantage and it was Baun again who was the benefactor of a brilliant cross-ice pass from Jonathan Ferland, the former Toronto Marlie picking his spot and firing home at 50:41. That killed off the game and, despite Pacha pulling Sjogren with 2:50 remaining, Dundee were unable to find even one goal to pull back as Belfast remained resolute on defense and ensured this season they'd start with the win they wanted.